We are the proud owners of four thousand dollar’s worth of Katadyn Powersurvivor 40E desalinator, but so far we had never managed to get it running properly. With the coast-hopping segment of our voyage behind us and some long non-stop passage-making ahead of us, I really wanted to get it going. The opportunities for filling up with clean fresh water over the top end and down the west coast will be few and far between. 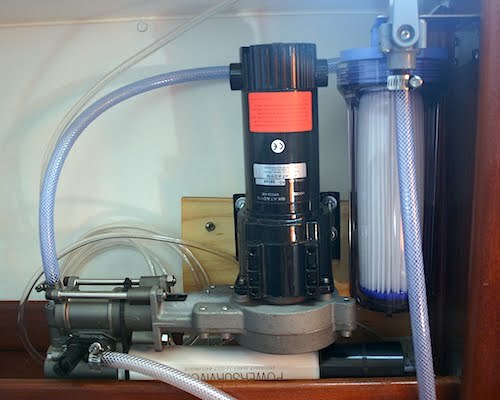 The problem with water-makers is that you can only test them when you are out in deep clean ocean, because any trace of organics (as found inshore) or chlorine (as found in tap water) can permanently and expensively kill the osmotic membrane. Since arriving in northern Queensland, we had been pretty permanently sailing through orange algal bloom, which is no good at all. The story so far was that sometimes it made water, and sometimes it just blew bubbles, and there didn’t seem to be any rhyme or reason to it. I variously re-plumbed, bypassed and short-circuited different parts of the machine in accordance with the instructions in the Katadyn manual, and after carefully following the troubleshooting flow diagrams, sent it back to the dealer for testing. The dealer fired it up, said that there was nothing wrong with it, and sent it back (a process that spanned several weeks and as many marina office drop boxes). I plumbed it back in, and hey presto it worked first time. We waited a couple of days and then tried again, and sure enough it refused to make any fresh water at all. It seemed to only work when I was testing it, not when I actually wanted some water. The dealer didn’t have any opinion apart from “there’s something wrong with your installation, maybe an air bubble somewhere”. Thanks a bunch. Far too late in the day, I thought of consulting Nigel Calder’s excellent “Boat Owner’s Mechanical and Electrical Manual”, and found that the limiting factor was whether or not the unit could build up enough water pressure on the osmotic membrane. Since the unit doesn’t have a pressure gauge, there’s no way to tell whether it has or not. Mr Calder opined that there is a direct correlation between the amp-hours in the house batteries and the pressure in the unit, but unfortunately the distinction between ‘the batteries are charged enough’ and ‘the batteries are not charged enough’ is too subtle to be picked up by our boat’s instrumentation. Before installing the unit I had done the math and knew that I would need to run the tow generator at the same time as the water-maker in order to get enough power, which is what I had been doing. On paper it looked fine, but perhaps the reality was different. I experimented some more, and after considerable frustration and more than one occasion when I announced that I was chucking the whole thing over the side, I settled on first running the tow generator alone for an hour or two to make sure that there was enough reserve in our (apparently already fully charged) batteries, and only then firing up the water-maker. Finally, the Katadyn makes water. We can now reliably make five litres an hour. If the sun is high over the solar panels and we’re pulling the tow generator at over five knots, then we can run the unit for three or four hours without unduly stressing the system. Since we can get by on about 15 litres of water a day, we are now borderline self-sufficient in fresh water. Hurrah! This entry was posted in Australia, Oceania, Travel, Voyage of Pindimara and tagged Gulf of Carpentaria, Sail on 2009/09/02 by Reinhard.